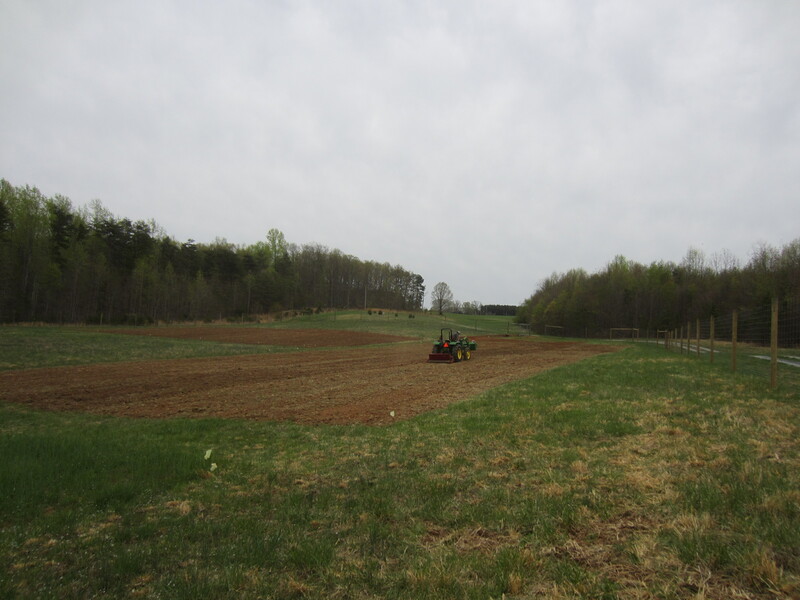 Now that our fields are enclosed and safe from deer, we’ve begun preparing new ground. 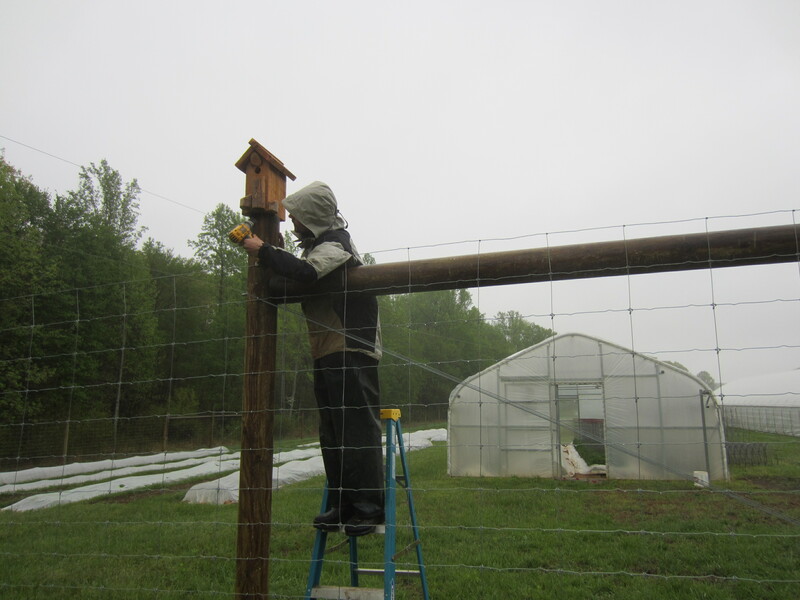 Gavin seeded two large blocks last weekend, which will probably start bursting forth with sprouts after all this rain we’re having now. 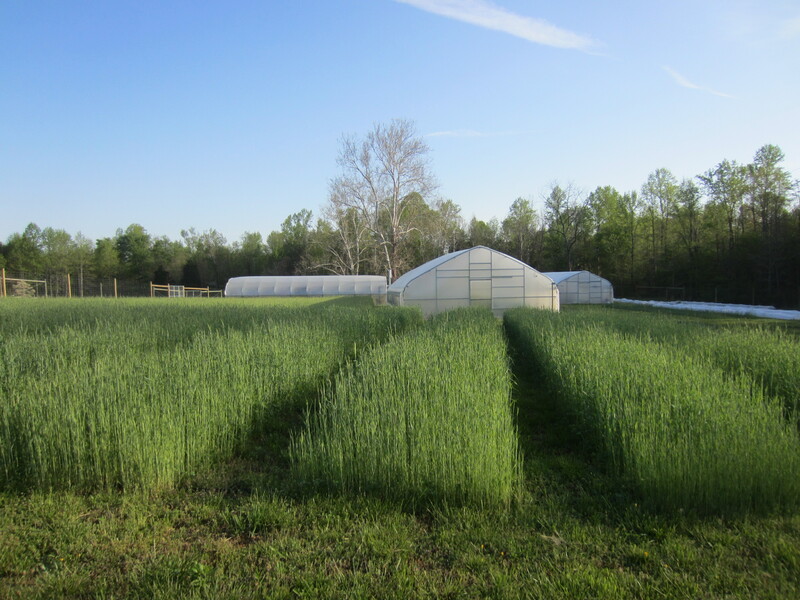 We have seen a few turkeys fly over the fence to eat some of the tasty seed in the field! The overwintered rye and clover are beautiful. One patch was mature enough to roll. 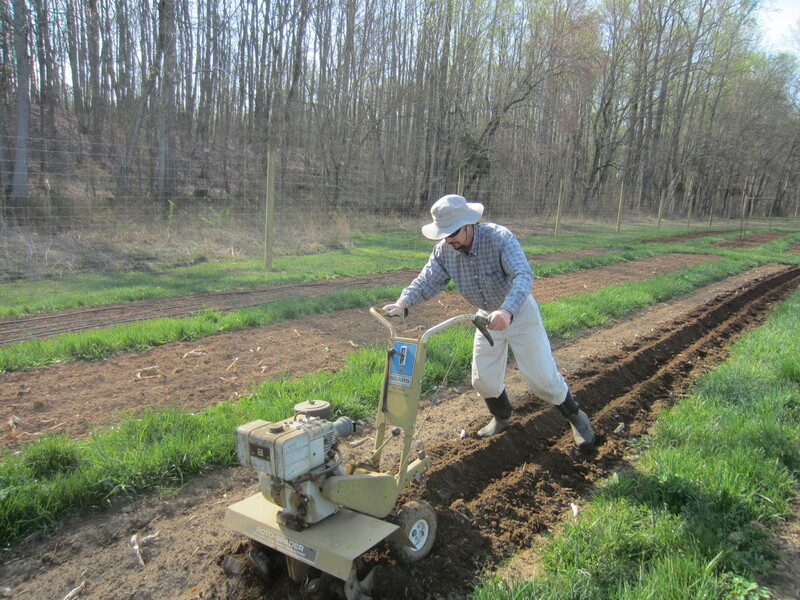 Since we don’t have a roller crimper or a flail mower implement, we used our seeder, which has heavy metal rollers. 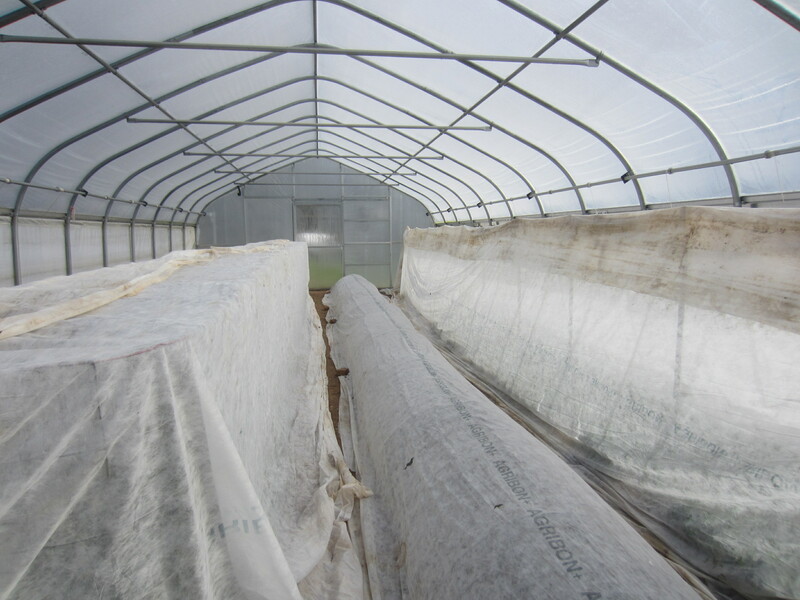 The idea is to knock down the cover before it sets seed and crimp it to prevent regrowth. 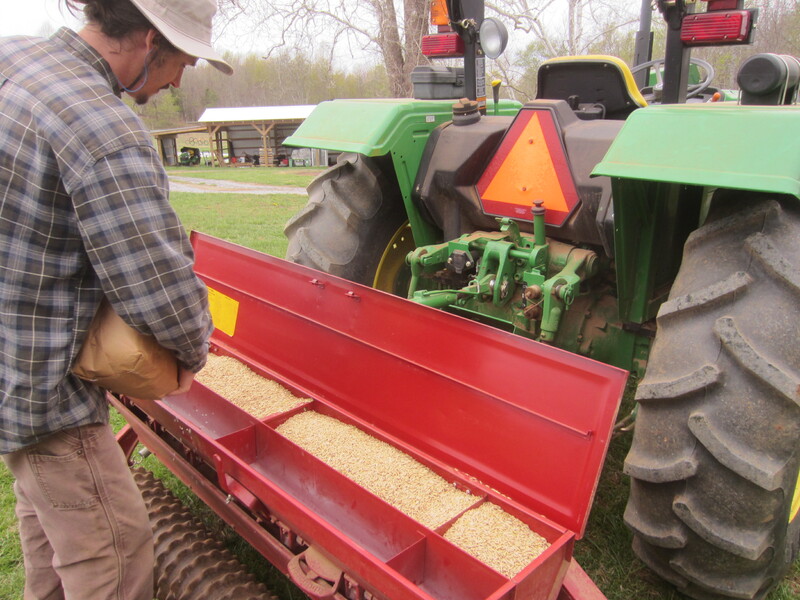 This creates a thick mulch which you can then plant into ‘no-till’ style. Or just incorporate into the soil to add organic matter, improve tilth, and feed the microorganisms. 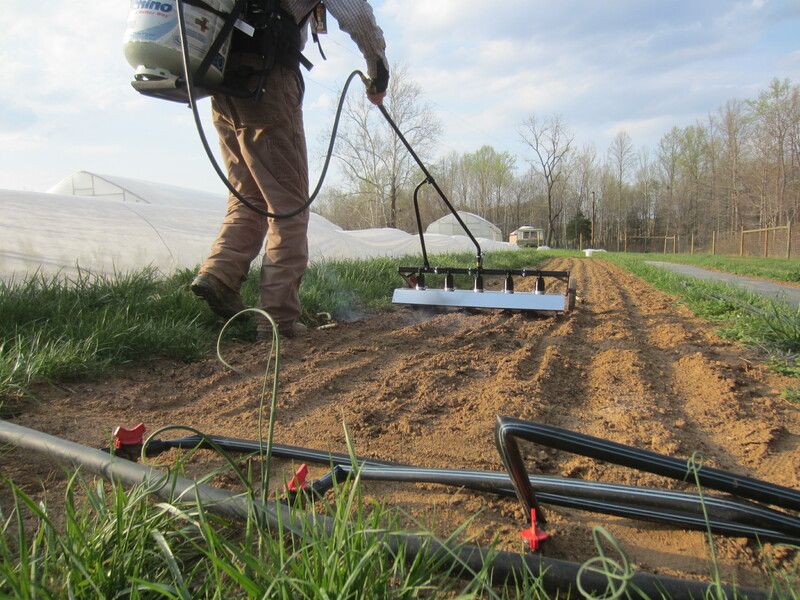 We’re just trying to build up the organic matter right now so we won’t be planting into it yet. 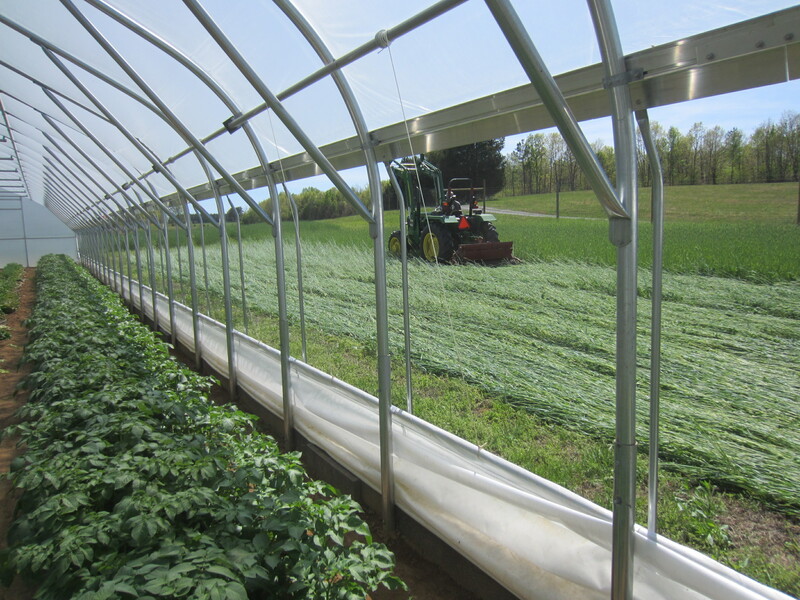 Check out that row of potatoes in the tunnel! It’s really coming along, and we should have new potatoes coming to market within a few weeks. 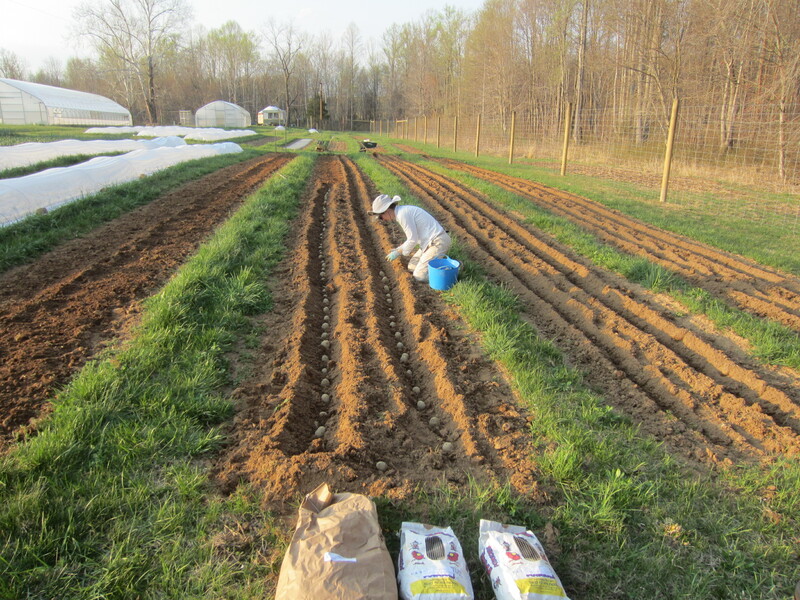 Also completed our big outdoor potato planting a few weeks ago. 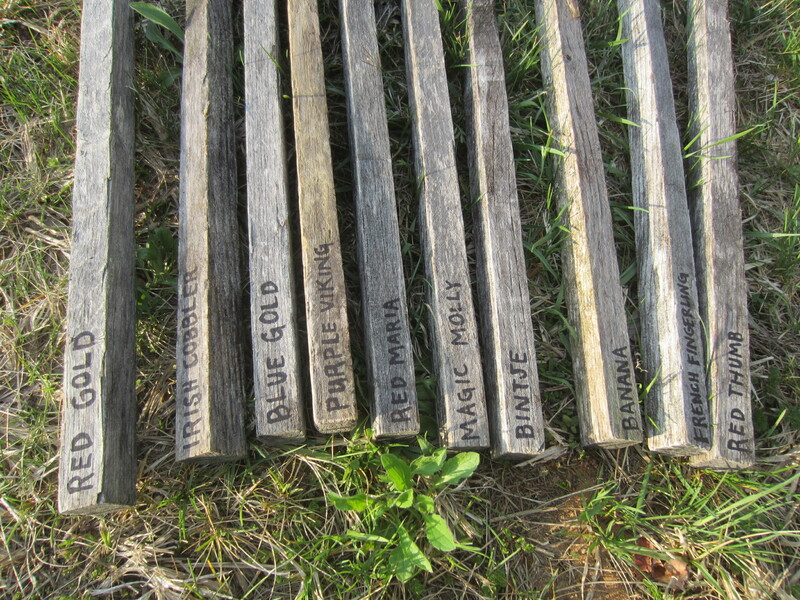 So many varieties to try… not enough land. And since we still dig by hand and don’t have a proper root cellar or walk-in cooler, there’s only so much we can do realistically. I was disappointed one of the varieties I loved from last year was out of stock and replaced in my order. Maybe next year we’ll get to plant you, Kerr’s Pink! But we will have some exciting purple varieties that look promising, Magic Molly and Purple Viking, as well as more fingerling varieties. Hunched over planting. What my job looks like most of the time. 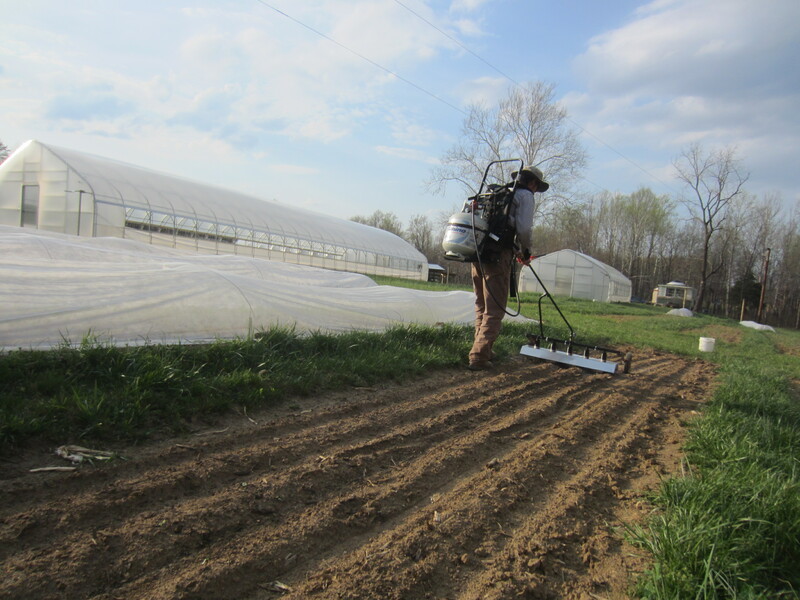 We’re trying to improve our carrot-growing skills this year by using a flame weeder. The idea is to flame the young weeds just before the carrots germinate. I imagine it will take a while to become effective at the task of judging when to flame. We had quite a cold spell in mid-April, dipping into the mid-20s. We made every effort to protect with extra row cover. The indoor crops were fine, but we did lose our first outdoor plantings of squash, and also a row of hot peppers. The squash will only set us back a few weeks, but those pepper transplants were two months old so it was a big loss! Most of the plants appear to still be alive and are resprouting from the stems but we’re not sure how they will ultimately do, so I ordered new seed and started again just in case! Good thing hot peppers are not a major crop, just something fun to add to the mix. 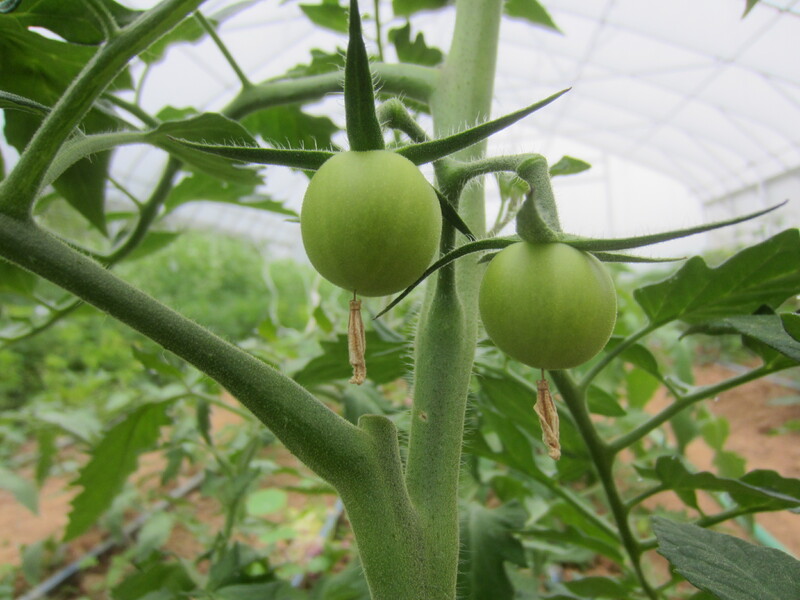 The tomatoes were unharmed, and I’m starting to see some fruiting!! 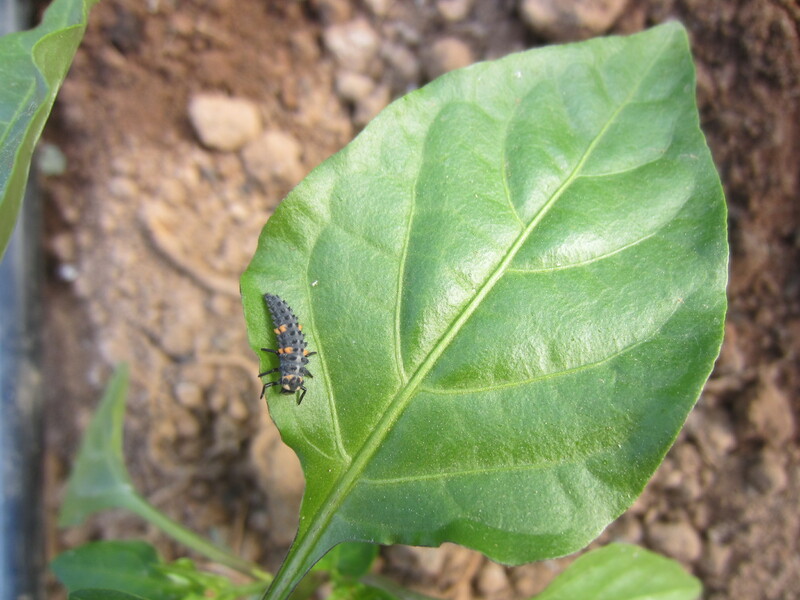 Ladybug larva seeking aphids for lunch. 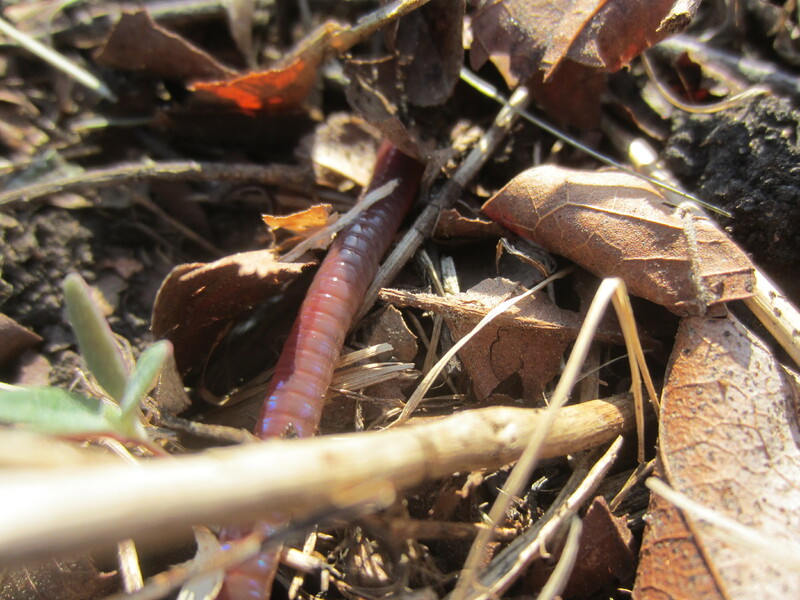 Shiny earthworm popping up through the leaf mulch. 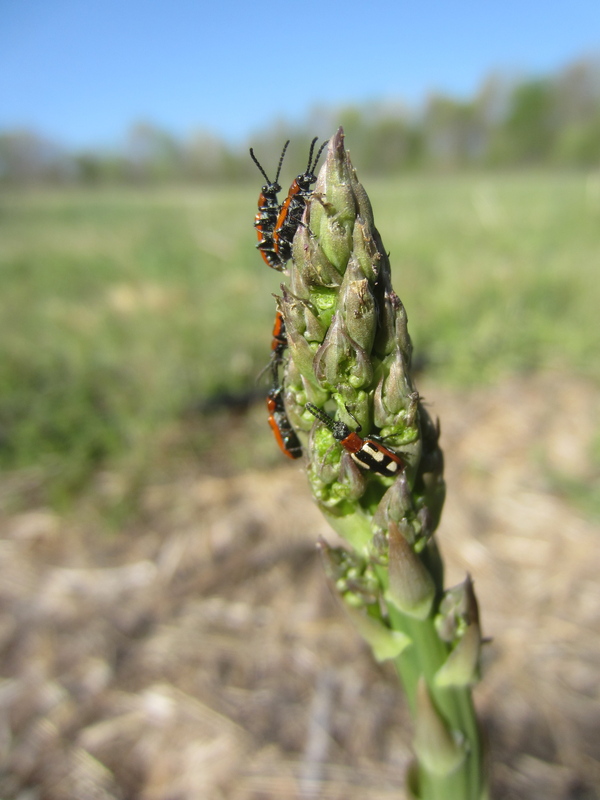 Prolific asparagus beetles flocking to their preferred food source. I like to pick and squish each one as I’m harvesting. Of course this takes forever, but I’d like to think I’m reducing the population, whether or not it is actually true. 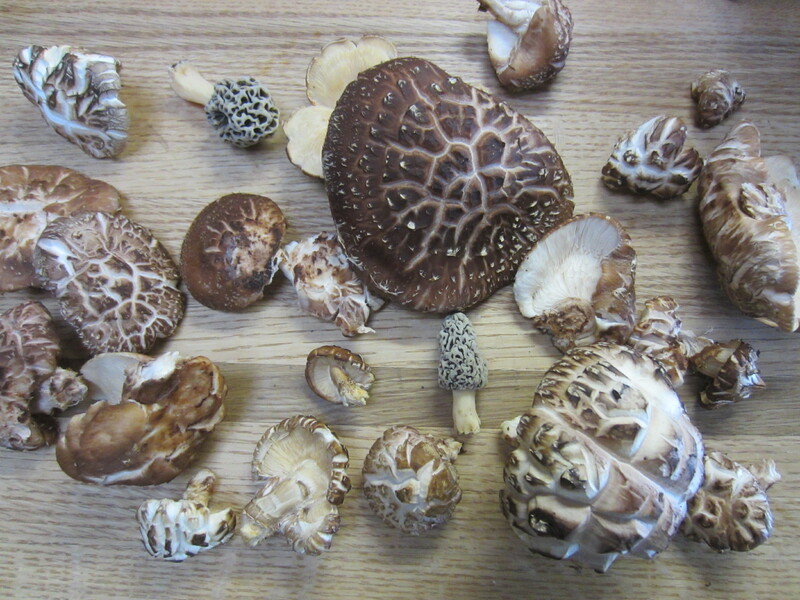 Starting to see a few shiitake mushrooms pop out, as well as a handful of morels. We were given this beautiful bird house by Gavin’s Dad about five years ago and this is the first moment we’ve had to hang it! I guess it just shows we’re finally beginning to really settle in here. Feels good! What fantastic work y’all have done and are doing! Well done. You too, my friend. Keep up the good work down there. Such great progress! Glad to see the pictures and commentary to catch up with what is going on there. 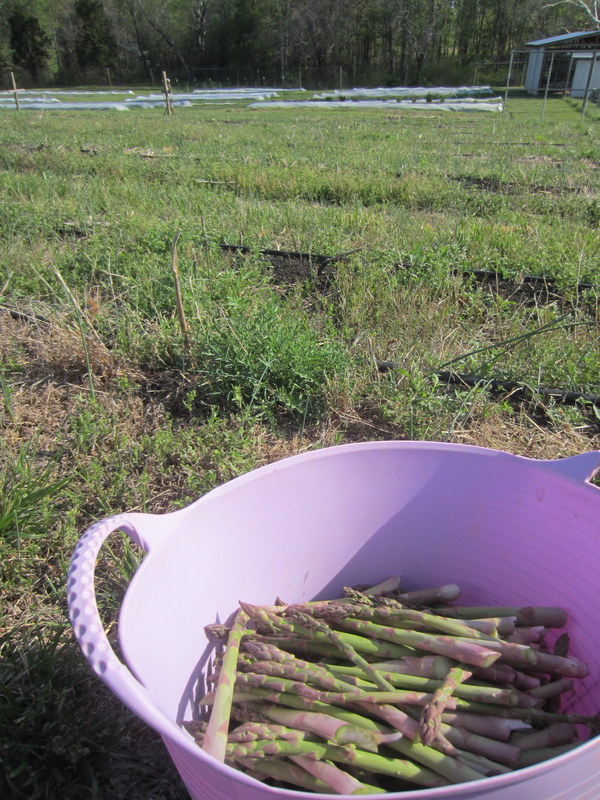 I’d love to get my hands on that asparagus! Thanks so much for all the news… VERY impressive! Plus it brings back so many memories… hand-seeding is definitely a JOB! Meredith – don’t you have a pad for your knees? Once I got used to it, it was really worth it! Nicole, you’re right, I should use something to protect my knees. They won’t last forever, at the rate I’m going! See you soon, and hi to Marshall! See you two on Saturday! Hello Meghan, so nice to hear from you! As I was awoken by songbirds this morning I was thinking how this time of year is just overflowing with joy and beauty. Happy spring to you, and may many songbirds grace your garden as well!